I hope you enjoy and give it a try!! Also, a quick note about Ustream. I am streaming again and will go back to my regular Wednesday and Saturday night schedule. My internet is out at home (who uses phone lines these days????) but a new provider is scheduled to come this Saturday. oh my goodness...I LOVE the way those transfers look. 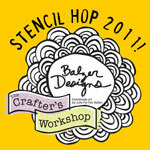 I have done the more traditional packing tape transfer before, but would have NEVER THOUGHT to do it thru a stencil. You are brilliant! This is such a cool technique. Thanks for sharing and glad you are back! WOW! So exciting. Thank you so much for sharing this. I'm inspired and am definitely going to give this a try. I wonder if the technique would work with images from old textbooks. Thanks for your generosity! I tried doing this on a 6x6 flower stencil, didn't work out! So, solution is to use 12x12 with a bigger image? Thanks Paula, you are inspiring! So pleased you are back! Thanks for sharing this so wonderful technique. I love both the negatives and the transfer. 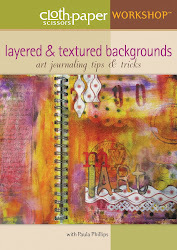 I will definitely try it to add great backgrounds to my art journal or layouts. As I said this morning I gave it a try and really enjoyed it. The great thing was that the negative came all by itself, floating ont op of the water! I do not have a blog or Facebook and cannot share with you but I am really pleased with the result. As I feel this technique is very addictive and since it needs so little stuff I am sure to do it again and again. Thanks again for sharing. This technique is AWESOME. Watched your video then played all afternoon! I have always loved packing tape transfers but this takes it to a whole new level - I need more stencils!! Thank you so much!! I'm wondering if you are okay? Missing your posts! I'm using the rounded knobs of an embossing tool to help adhere tape against the paper image especially around the edges stencil and the spaces. 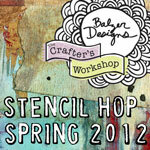 It seems as if my stencils are thicker so the brayer won't do the trick. My first stencil transfer is with a bird stencil on top of a page of migrating geese into the sunset from a nature magazine. Thanks for sharing another technique to maximize our stencil value/budget. Thank you for sharing this technique. I had never heard of packing tape transfers. I like the effect of the stencils. One question, when you put the tape on a journal page does this have to be the final layer, or can you paint, stamp, glue etc on top of the tape?